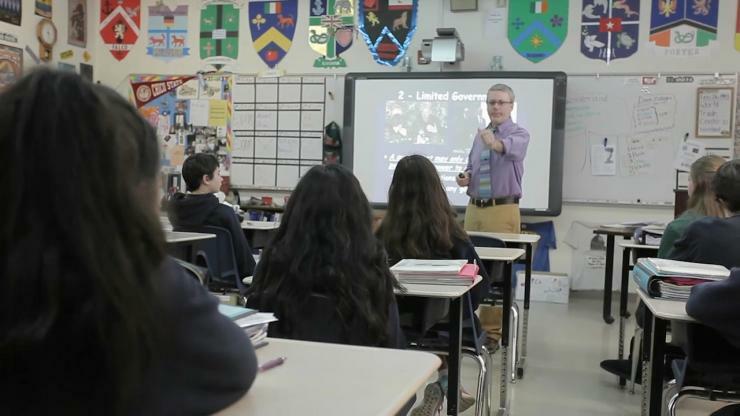 St. Albans Country Day School offers students a challenging academic curriculum in a safe and caring environment where ethical conduct is emphasized. Small classes, high expectations, and progressive instruction help create an atmosphere where students acquire a broad foundation of knowledge and skills. Individual talents, teamwork, and an appreciation of diversity are fostered through a variety of enrichment programs. Character Education helps promote integrity, empathy, and a concern for others. Continuity, structure, and discipline are valued from grade to grade while exploration and creativity are encouraged. St. Albans students learn the core subjects of math, science, social studies, English, and Spanish, as well as, music, art, computer technology, and physical education. All homeroom classrooms from kindergarten through eighth grade are equipped with interactive Promethean whiteboards and students work with technology not only in a dedicated computer lab, but also in classrooms with the use of a mobile learning laptop cart and small group tablet instruction. The school provides a comprehensive and sequentially documented curriculum that is articulated within and across grade levels for the improvement of programs, learning, and teaching. Curriculum is developed and refined on an on-going basis and is examined and revised according to national and state standards. The kindergarten through eighth grade curriculum is tied to California State Frameworks, state or nationally adopted texts, and national standards. Teachers also use information and materials from professional workshops, conferences, and personal publications to enrich curriculum for all students. Teachers utilize data from Stanford 10 testing to establish a baseline for student achievement and to modify curriculum as needed for each individual class.